Something magical happened on this past Sunday as ten soulful and ambitious women entrepreneurs gathered for our “Heal Your Heart #rememberlove” urban retreat; and our hearts are bursting to share it with you! It was a day steeped in opening, healing, and blossoming the heart space. In the morning, we released energy blocks in the heart center through the Hawaiian Heart Healing method we were taught by the elders. This was followed by accessing, revising/releasing old sacred agreements that were impeding our spiritual growth; and integrating new ones that will pull us forward in the direction our heart desires. For many of us, the walk was what we needed to integrate the intense morning. It was both awe-inspiring, and deeply moving to witness a group of women, holding a safe and sacred container for each other in a public space. Sooooo many AHAs came through with each step we took in silence, in sync, in solidarity. When we returned, it was time for what we call the “infusing soul into strategy” segment of the retreat. We taught the three spiritual pillars of a relationship; and how to translate that into strategies and actions for building authentic, powerful, and strong relationships in business and life. It was during this time when we sensed both a deepening and an expansion of the energies in the room. Tay took a moment to tune in, and realized that everyone was processing not just for themselves, but also their tribe. This came across as resistance – confusion, vagueness, and frustration. It was our cue for the next segment. We gathered in a circle, held hands, and both of us began singing a prayer. After the first stanza, Val started coughing. Out of the ten women in the circle, more than half of us are highly-sensitive empaths; and all of us are in the business of helping others. As Val’s coughs turned into a choking sound, Tay felt a few people leaning forward energetically, instinctively wanting to help. Tay asked about it later. Val had felt a wave of sadness so strong that she choked on it. But she kept singing – croaking actually. The way Tay heard it, she was crying. But it wasn’t her crying. We (Tay and Val) have sang this prayer at least a hundred times and have never heard the prayer sung this way. The energy in the circle was intense. Tay felt it and we’re sure everyone else did, too. Everyone continued to hold each other’s hands. No one let go. In a split second, Tay ‘saw’ everyone return to their personal space – remembering we told them that today was not about rescuing anyone; that healing is about bearing witness, not fixing. As Val’s singing percolated throughout the circle, a second wave of magic happened. Everyone stayed anchored – in their space, in bearing witness. No one let go. No one ran to Val’s rescue. The energies shifted. We were like the calm center of a hurricane, while energies swirl outside of us. 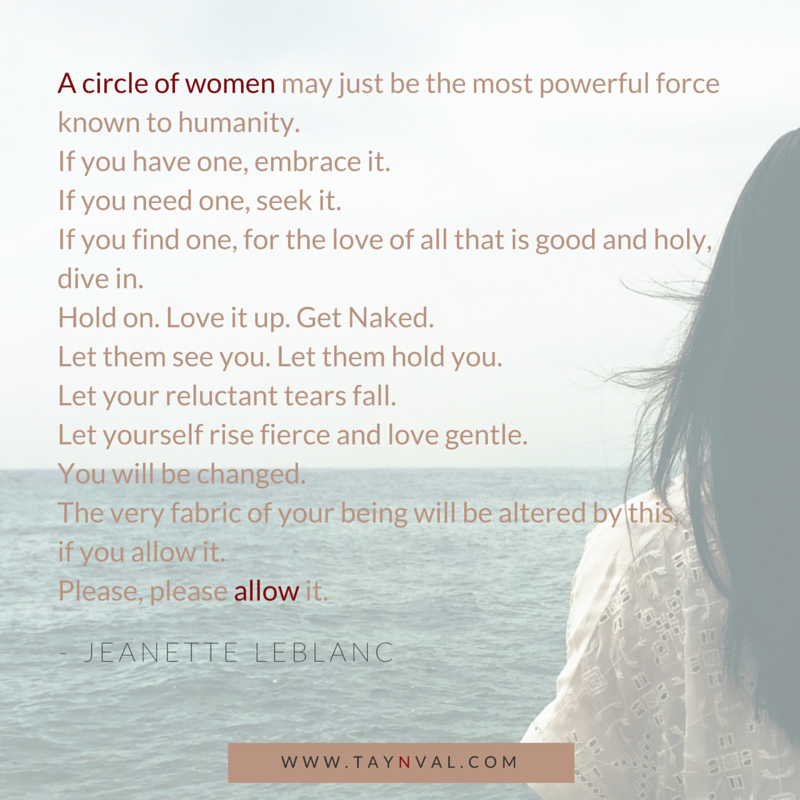 We became a circle of women holding space for ourselves, for each other, and our tribes to finish the healing prayer. We remembered LOVE. Self-love. Empowering love. Universal love. Being able to extend our love to someone else without compromising nor over-compensating. By doing that – we gifted each other back to ourselves; we held space for us to be with our own emotions; we rised together, in our own power to heal. This was our greatest takeaway from last Sunday’s retreat. The love and grace of a circle of women. Because there is also something most of you do not know. Val came from a family of medicine women, mediums and channelers. They performed healing in its oldest form – absorbing it from the sick and purging it out through their own bodies. She never wanted to do healing in this way and ran as far away from it as possible. Yet, it was precisely what she did at the retreat; but differently. You see, Val’s superpower is clairaudience. She hears a lot (like, everything). At times, it can get overwhelming. Especially when she hears the cries of pain, grief and deep sadness. Like she did, at the retreat. But instead of blocking them off and delivering a pitch-perfect prayer (she’s also professionally trained as a singer), she’d let all those emotions come through her, acknowledged them, and allowed the healing that needed to happen, happen. She took what she was so afraid of and did it anyway. Because of that, Tay felt herself, and the rest of the circle released grief they never knew they had; or more accurately, grief we never knew we were carrying for others in our tribes. We’ve taken the last few days to integrate the experience. Including Val swinging from, “Do you think I will dare to sing this prayer again – ever?” to fully realizing the breakthroughs BOTH of us had as spiritual teachers and soul mentors. In other words, an up-leveling had occurred for us in our work and lives. Our Circle had brought us here – hearts wide opened, tender, brimming with love. We had to write this post, to send you – our heartfelt gratitude, for allowing us to be in Circle with you. P.S. Thinking of someone – a sister, a friend, or a colleague – who’s been in Circle with you? Send them your love. Share this post or this lovely poem from our friend Jeanette with them.